Five months later, we forget the exact words in his response, but we will never forget how his response made us feel that evening. In the spirit of the holidays, we opened our December board meeting (Bob’s last Someone To Tell It To board meeting) by asking everyone in attendance to answer a probing question from a My Intent question card. The exercise was an aspect of My Intent’s mission “to be a catalyst for meaningful conversations and positive energy in the world,” a perfect way, in our minds, to begin the meeting by fostering deeper relationships among our team and practicing what Someone To Tell It To preaches about compassionate listening and training others to do the same. Where have you found peace? What could you do, right now, to serve others’ needs? What moves you to tears or gives you goosebumps? What have you witnessed that has strengthened your faith in humanity? Bob, without a moment’s hesitation, was the first to respond, breaking the ice and breaking the chance of any awkward silence in the room, and we loved his response. For a mission that is all about modeling and encouraging compassion, empathy, and valuing the inherent dignity and worth of every person, his beautiful reply truly warmed our hearts. It’s when I see compassion. It’s when I see kindness. When I see people caring for and about one another. When I see people being considerate and respectful and generous and putting others’ needs ahead of their own. When I witness those things, people being thoughtful and helping to make life better, then my faith is strengthened. People genuinely showing up for one another—because life is hard—and we need one another. That’s what makes the world better, and that’s why I’m proud to be a part of Someone To Tell It To. Bob’s genuineness and words in that moment were deeply heartfelt. We’ll never forget how the beauty of that moment felt to us. 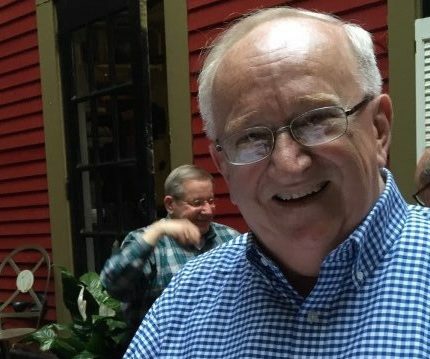 It is with deep sadness that we share the news that Bob Haigh, this eloquent, compassionate, progressive, gentle man, passed away late on May 12, in Harrisburg, Pennsylvania, after a difficult last few weeks and nearly two years of fragile health. Bob served Someone To Tell It To well. He made many valuable connections for our mission, advocated for us, and always did so with eloquence, a great wit, and a sharp and gloriously wicked, irreverent sense of humor, in which we especially delighted. We valued him very much and miss him deeply. Bob led a remarkable professional life, serving in Pennsylvania state government for many decades in the area of mental health services. He held high-ranking positions, serving alongside numerous cabinet secretaries. His contributions continued in his retirement as he maintained significant involvement in many groups, projects, and issues related to his field. STTIT benefited greatly because of him. Even though his health was severely compromised the last few years, he never gave up and always sought to serve and give. We are immensely grateful for Bob’s commitment to STTIT’s mission and his community service to enable greater care to be given to so many who live in great need of emotional care and support. Bob, a self-described “lapsed Methodist” always exclaimed his disbelief that he had embraced a mission founded by two pastors, both of whom have served in Methodist churches. His skepticism about organized religion and the church came from what he saw as the tendencies of too many in the church to exhibit an over-abundance of shame and judgment and a remarkable under-abundance of compassion and kindness and respect and generosity and thoughtfulness. A lack of love. We resonated with that. We’ve seen it too. Bob was actually the kind of person the church and the world need: a genuinely compassionate person who, throughout his life and his career, never stopped being compassionate and loving—not just in his words, but also in his deeds. Drinking coffee and hot chocolate and tea at the Little Amps coffee shop down the street from our office in Harrisburg or eating coconut chicken salads at Bob’s beloved Dodge City restaurant nearby, where we were first introduced to him, will never be the same. We won’t laugh as much, definitely. He knew everyone in this capital city community. We won’t be connected to so many community leaders as much as we were with him, either. On our last visit with him in the hospital just two days before the end, we actually thought he seemed improved, that we might have him with us in this life a little longer than we did. But that’s not how it turned out. His spirit lives on in us and it will continue to propel Someone To Tell It To to new and greater service. His last major gift to STTIT, a connection he made for us, is resulting in a new relationship with the premier community health clinic in Harrisburg, enabling us to train its staff in compassionate listening. Our work with the clinic—a multicultural, multilingual, family-friendly center, providing service, as STTIT does, regardless of income status—will be even more special because it was made possible by Bob. We dedicate our time serving there to him. We express our empathy and condolences to his gracious and dedicated sister Linda, who shares so many of the traits we love with Bob. We are sorry that we had never known Bob’s late, dear wife, Carolyn, about whom he often spoke. She had to have been special too, to love a man such as he. We wish there were more Bob’s in this world—generous of spirit and forward-thinking, generous in thoughtfulness and friends, generous in heart and in compassion. His are gifts our world so desperately needs. Previous: Previous post: Where is the love?